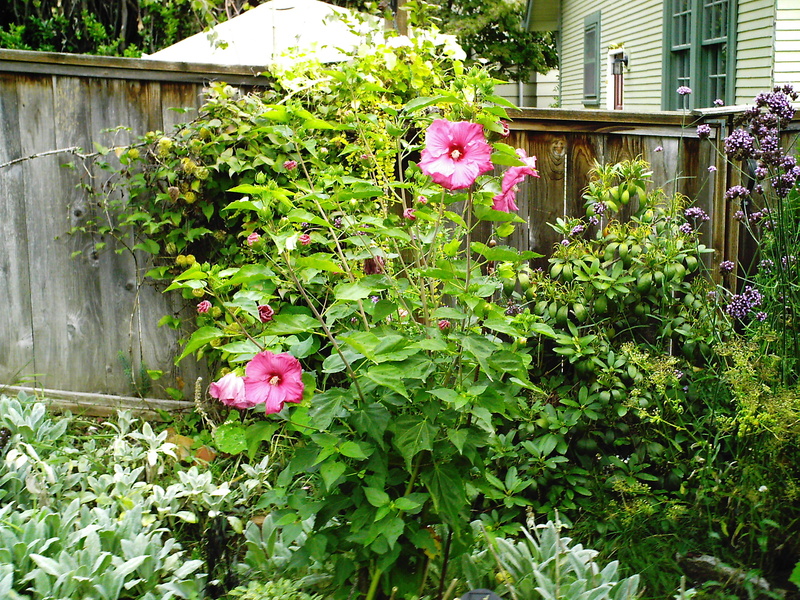 Hibiscus, Morning Glory and Tomatillos–Oh, My! Meet ‘Sweet Caroline,’ a very pretty, late-blooming hibiscus. This plant is around four and a half-feet tall, and the flowers are huge–bigger than the size of my spread palm! I love this bright flower–it makes me happy when I walk outside and see it. My favorite morning glory, a variety called ‘Heavenly Blue.’ That shade of blue is just right–and I love how it looks with the waves of purple Verbena bonariensis below it, and one sprightly orange nasturtium, ala Van Gogh, for a pop of contrasting color to set everything off. Nature planted the nasturtium there for me, but I had the common sense to leave well enough alone! I love tomatillos. 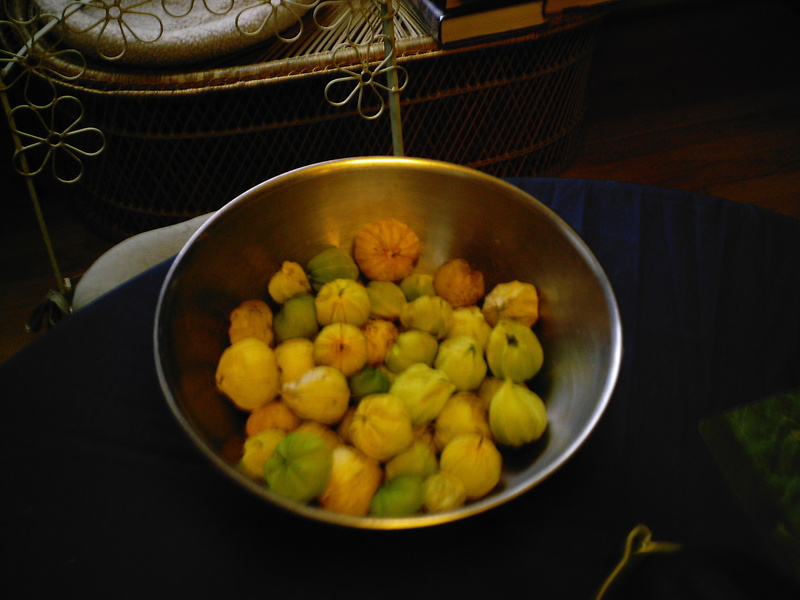 I planted two plants, so that they would cross-polinate each other, and the result was that I got much larger tomatillos than I did last year with just one plant. However, they did not produce as heavily as last year–was it the cooler summer temperatures, was it the particular variety of plant–who knows? All I know is that they got turned into a great salsa verde, inspired by a recipe by chef Rick Bayliss. It gets heated up in a pan, and sliced greens are added so that they wilt, and into that goes some shredded cooked chicken. This is a wonderful taco filling, which we are having for dinner tonight. I also spent time today making a big batch of homegrown tomato salsa, which will go into the freezer, and I snacked on a few fall-bearing raspberries while I was out and about in the garden–have to keep up your strength, ya’know. I hope you are enjoying your garden right now–let me know what’s growing and producing well for you now at the end of September. And visit the Garden Party. I have been looking forward to this fall, because fall is the time of year when grapes are ripe and ready to be harvested. 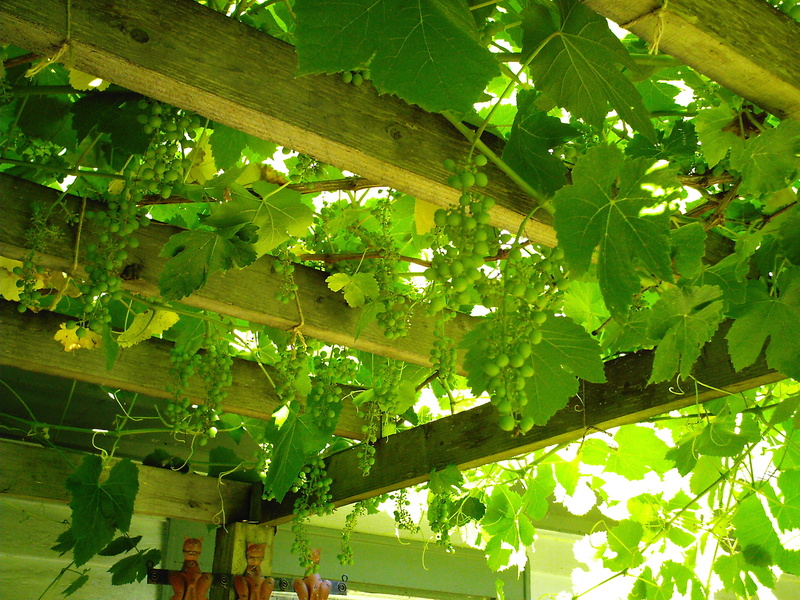 The grapevine that I have growing on my outdoor pergola is an ‘Einset’, a red seedless table grape. 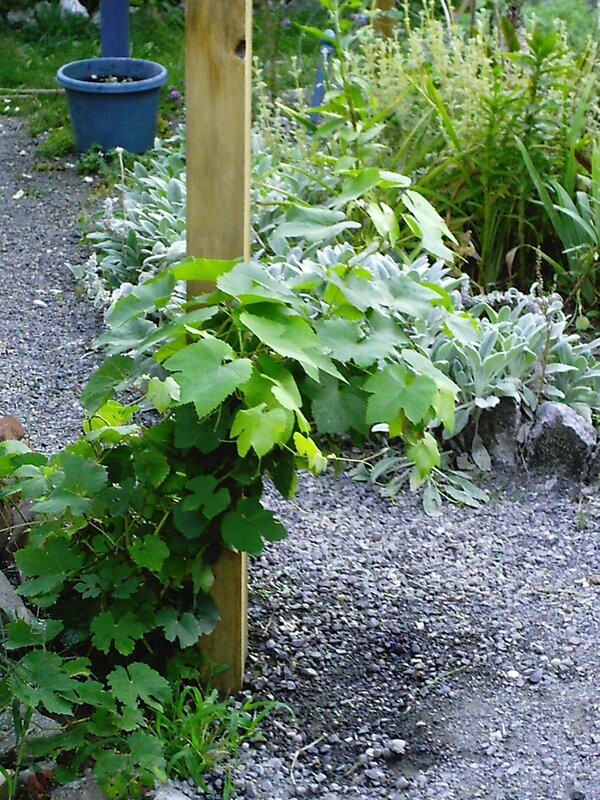 This particular variety was recommended to me by the head arborist at the Home Orchard Society at Clackamas Community College, where they have an arboretum of fruit trees, but which also includes grapes and figs, and other types of fruit. I’ll show you the progression of this vine. As you can see, there is one plant crown, but four trunks growing out of it. This caused the grape vine to produce a ton of leaves and no fruit. I knew I had to learn how to prune it to get it to produce fruit. The first thing I learned was that there is only supposed to be one trunk coming out of the crown. 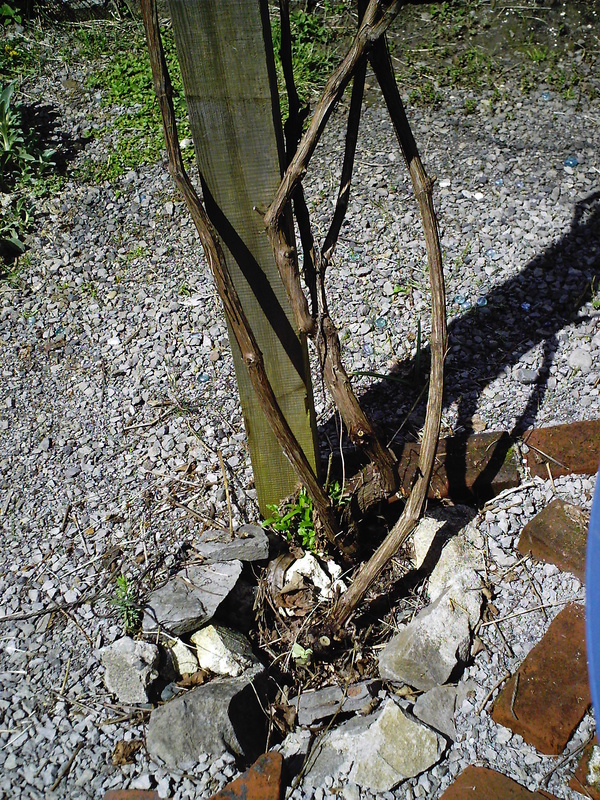 But I had grown this vine from a tender baby, and I didn’t want to kill it, so I cut it down to two trunks. (I know, I am a pruning wuss.) I figured if something went wrong, I’d still have one trunk left to play with. I don’t have good pictures of how to do cane pruning–I was doing well to get out there and prune it at all this time around. My hope is that next year I can take some and do a more detailed post on how to do it. But basically, each trunk produces two cordon arms (You have to train it, ie. prune it, to get it to do this), and from this arm you want to have at least sixteen canes coming out from each of the cordon arms, because this is where the grapes are produced. You also want to keep a spur, a short cane, near the base of the cordon arm, with the idea being that the spur will grow long over the growing season, and next year you replace the cane that produced fruit the year before with the fresh cane that grew from the spur of the previous year, to constantly rejuvenate the plant each year so it produces well. I positioned the cordon arms and the canes so they were spread out over the entire pergola roof, and tied them into place on the wooden beams of the roof. So here it is cut back to two trunks, and I “limbed’ it up so there was no leaf growth until the stem got to the very top of the pergola roof. Notice that there is a lot of open air showing through the roof at this time–not much leaf cover yet. Notice that there’s not much open space at all now–it is completely covered in leaves . . . and also, finally, baby grape clusters! 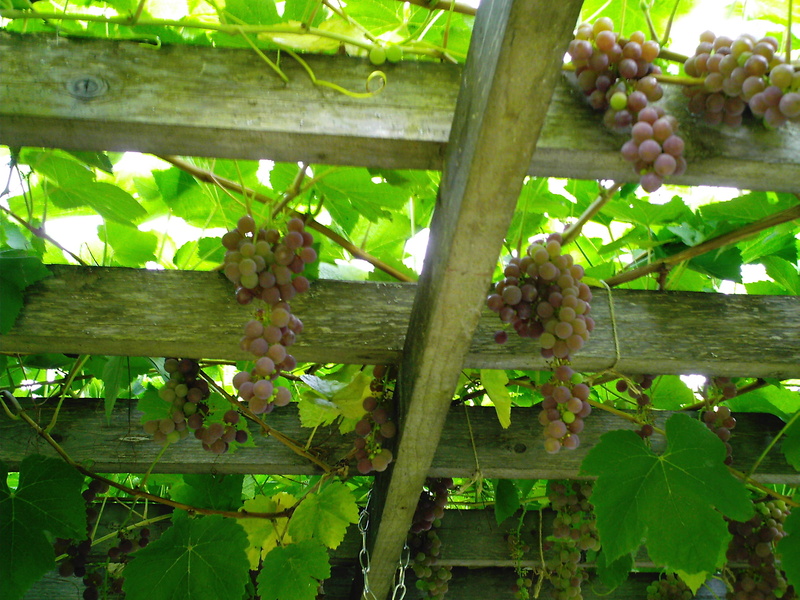 Having it growing on the pergola made it very easy to pick the grapes later, so I liked that. And I love how they look–they are small, green and tart at this stage, but the clusters are even pretty for decorating a buffet table if you’re having a party. 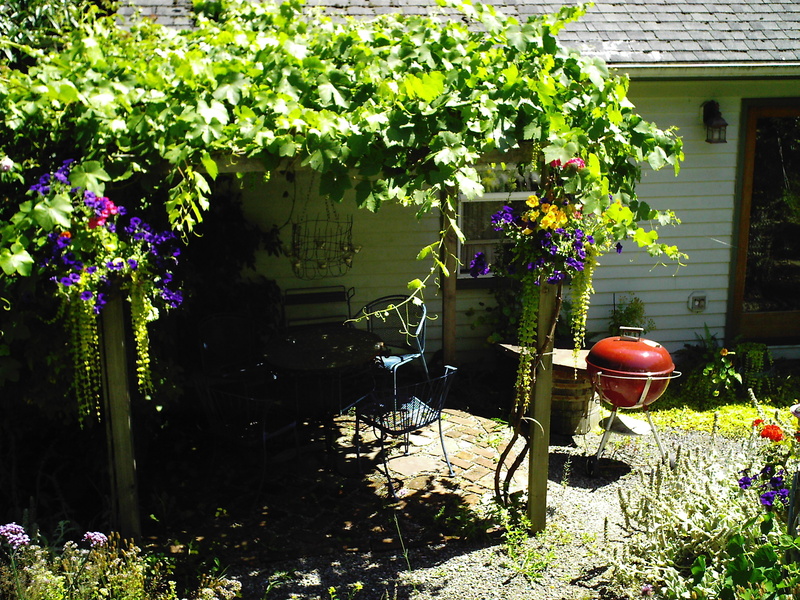 Now technically, you are supposed to thin the grapes, either remove entire clusters, or remove some of the grapes–the tips—from each cluster, but I wasn’t sure how much the vine would produce, if at all, so I didn’t thin this year. And frankly, it didn’t seem to hurt anything. Also I’ve been told if you thin, it produces sweeter grapes, which could be true because the vine is putting its energy into less fruit, but I just decided to leave well enough alone this time around. 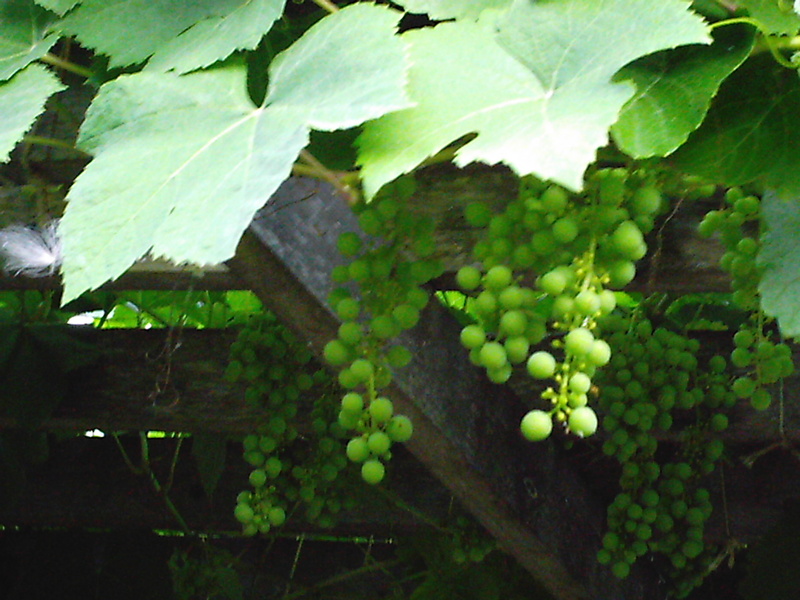 If you have a young vine that is only just starting to produce, the advice is to thin the fruit so it doesn’t wear itself out with a huge crop early on in its life, and then let it gradually produce more and more each following year, so the framework of the vine can support the growth of all the fruit. The grapes are still green, but filling out and getting bigger. 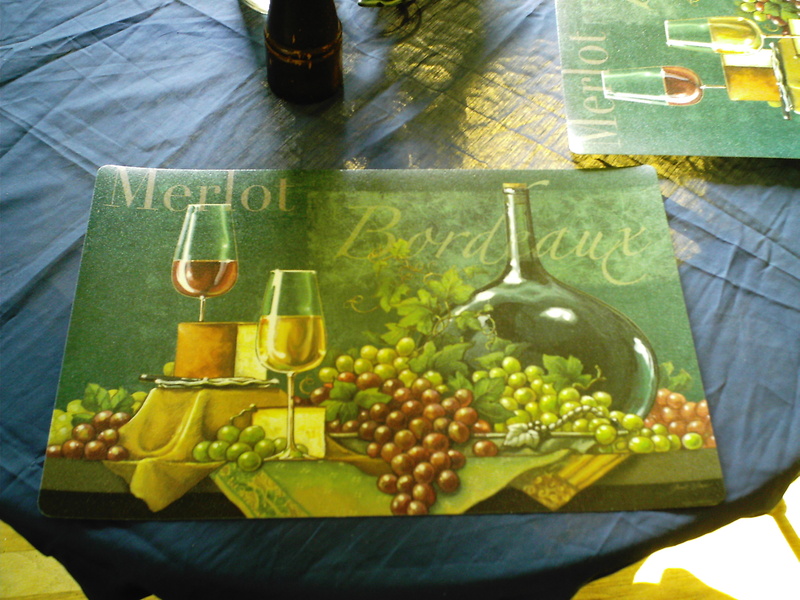 So, we were in business–eating fresh and delicious ‘Einset’ table grapes by Labor Day Weekend! I still don’t have a completely developed cane framework yet with this vine, but nevertheless it produced a lot of fruit for us for about two and a half weeks. There were a few final grape clusters that I was giving one more day to ripen, and something (birds probably, or a raccoon?) came out and overnight had a big grape-eating party. I came out the next day, and there were grape leaves everywhere, and fallen fruit, and empty stems on the grape clusters! So that was the end of that! 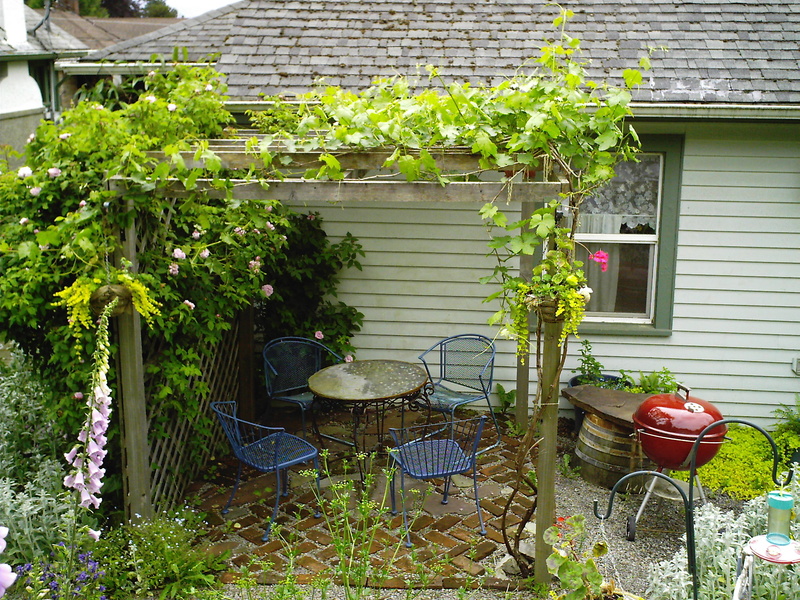 I also had people warn me about growing grapes under a pergola where we had a dining table. They said the bees would become a problem, but I had no trouble with bees at all. Perhaps because I kept the grapes picked often, so they didn’t fall to the ground and attract insects. I also have a ton of flowers nearby, and maybe they were so busy with the flowers they didn’t bother with the grapes. It does produces a dense leaf cover that makes it kind of dark when you are seated there, but that’s why you add a candle chandelier! For more information of growing and pruning grapes, I recommend Ron Lombaugh’s book called The Grape Grower. Ron grows grapes locally in the Willamette Valley of Oregon. So that’s it for my grape-growing adventures for this year! 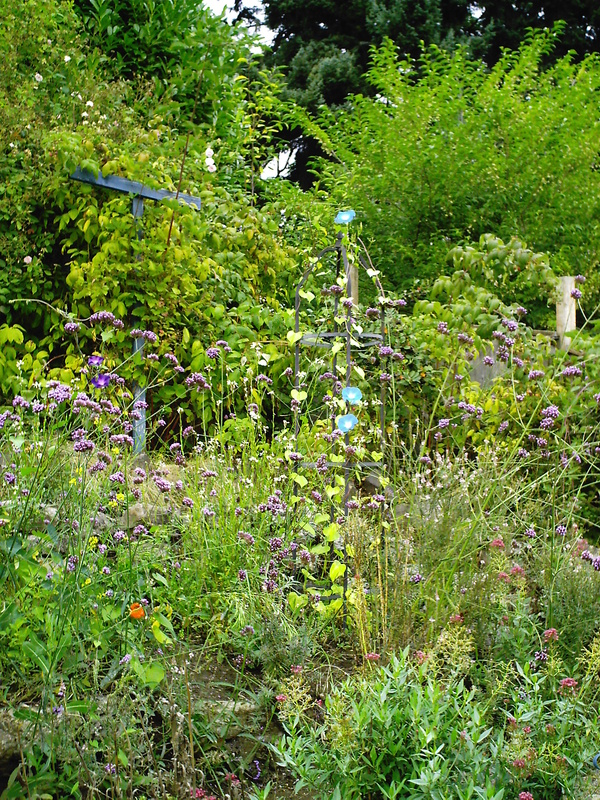 What gardening adventures have you had this season–do tell in the comments! 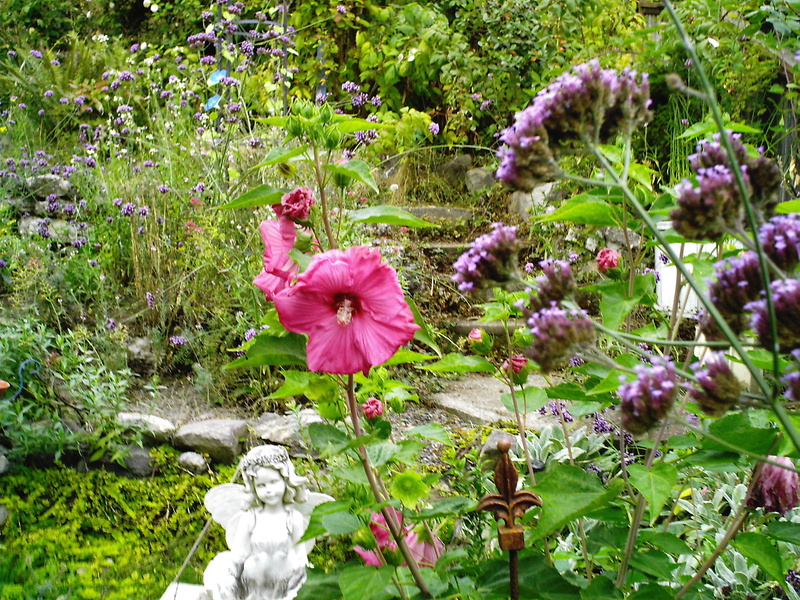 And visit the garden party. 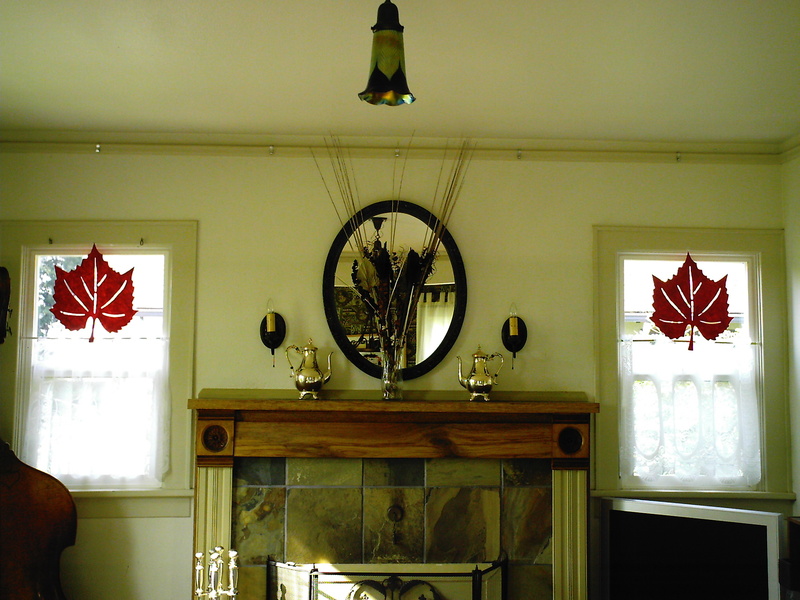 I decided, even though it was ninety-two degrees yesterday, to start decorating the house for the upcoming autumn season. I wanted to be a little bit ahead of the game this year, so started a little earlier than I have in the past. 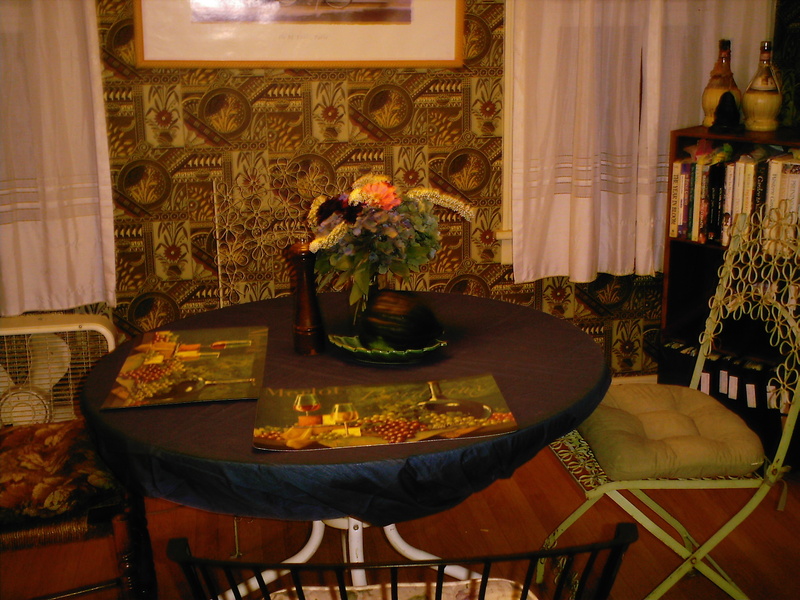 This is a little dark, but essentially I got a dark blue sheet from Goodwill, and fashioned it into a tablecloth. I was totally inspired by that shade of blue of the tablecloth, and I have had my eye out for things that would work with it. 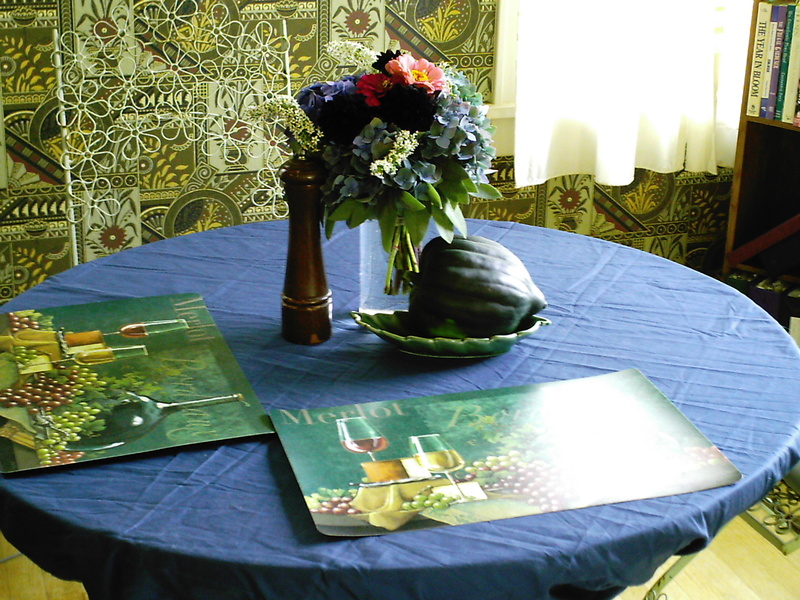 I next found these fun table mats at Dollar Tree, and loved the shades of dark blues and greens that were in them, and that got me going on the rest of the table vignette. I created a flower arrangement using blue and smoky purple hydrangeas as the base, and added dark burgundy dahlias and pink zinnias, and for an accent I added sprays of white clethra. I put a ruff of purple sage all around the bottom. I like the look of dark wood in the fall, and thus I added the wooden pepper mill. I have been collecting leaf plates at Goodwill for a while now, and decided to pick one of the hybrid acorn squash from the garden to place in a green leaf plate. 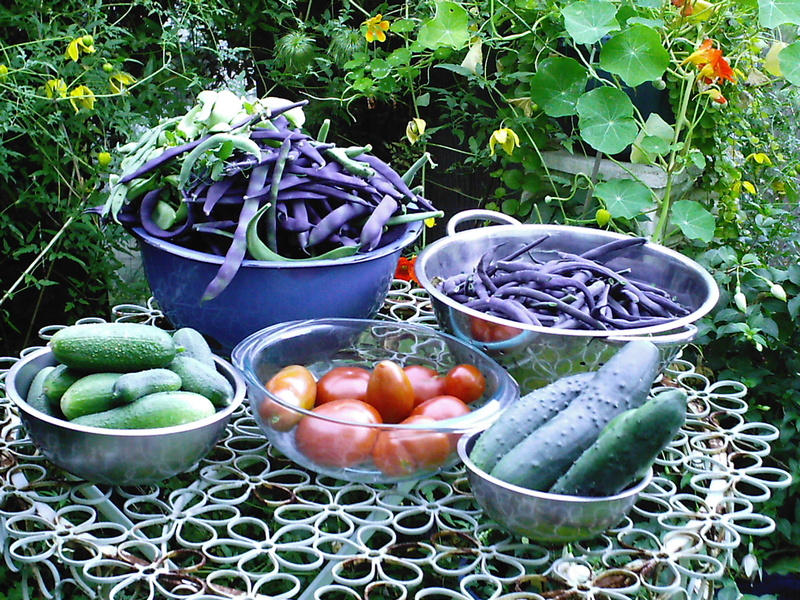 (Those hybrids are stringy on the inside and no good to eat, but I let them grow so I have lots of squash to use for decorating in the fall.) 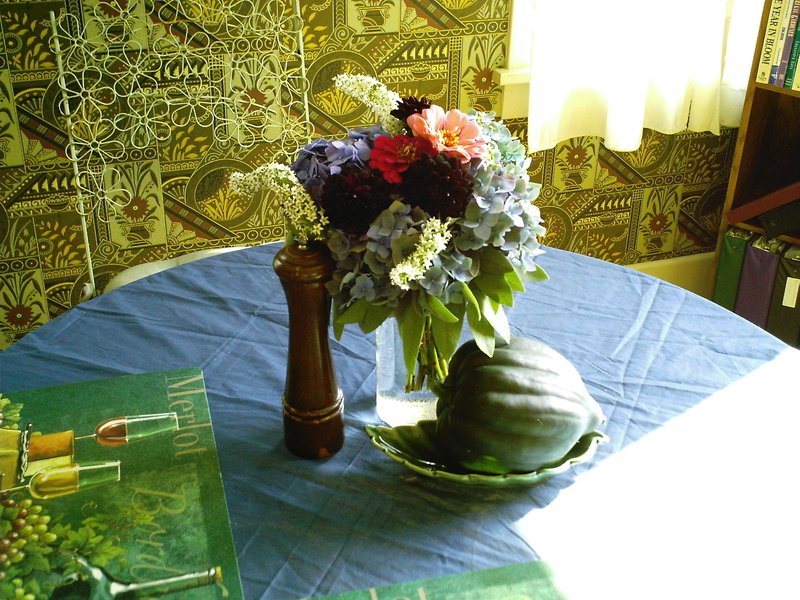 I thought they all went together nicely, and for me this is a table look, because of the blue tones, that make a good transition from summer into the fall. And all from Dollar Tree! I love those felt leaves, especially the cut-outs that allow the late afternoon light to shine through. And I have become more in love with tall things in front of the mirror over the mantle–all of this, in smoky dark blues, (to pick up the table cloth color) and some bright warm colors, with tall sticks all came from Dollar Tree, which I put in a vase I already had. 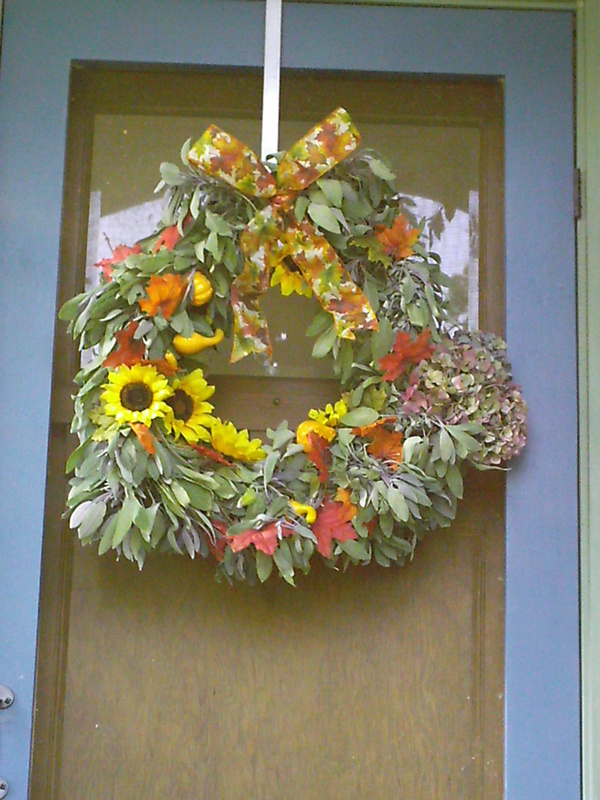 Then I decided to get crafty and fashion an autumn wreath for the front door. Have to say, I am not a big “crafty” person, not really where my skill set lays, so this took me a lot longer–about two hours and change–than it would for someone who is more versatile in this area. Having said that, it was not hard to make, and quite inexpensive as well, because I used what I had around the house and augmented it with items from Dollar Tree. I liked the idea of smoky purple indoors, and wanted to extend that look outdoors as well, particularly because we have turquoise trim on our screen door, so I thought that would look good, and wear well hopefully all the way until Thanksgiving. 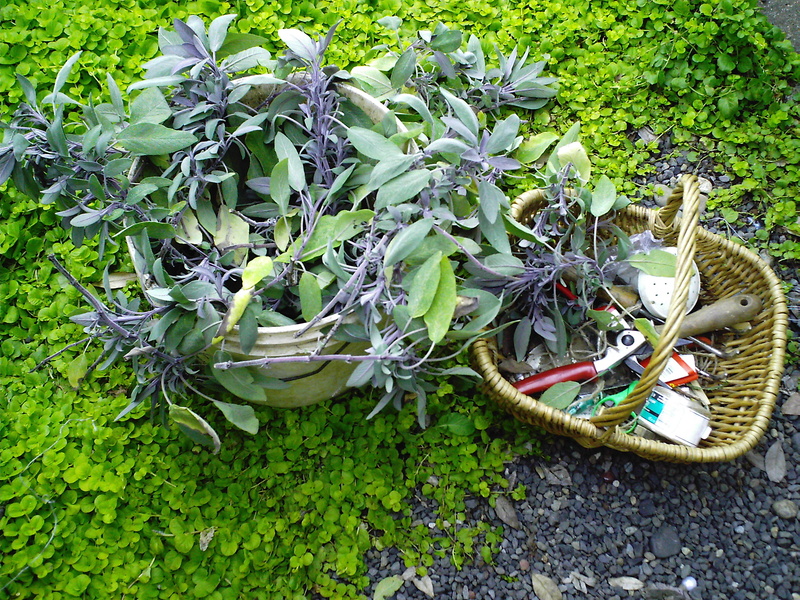 I used about 3 buckets of purple sage cuttings. 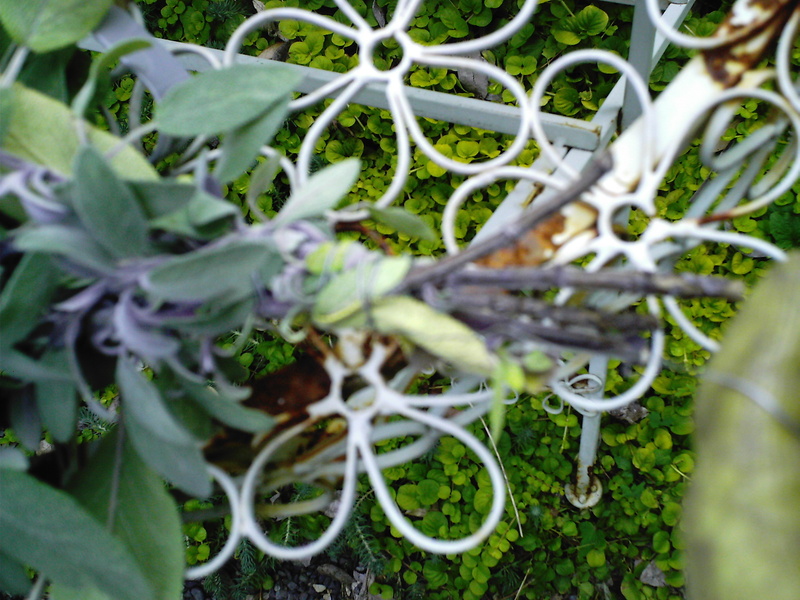 Okay, the next pictures are not my best, because I was trying to hold and wire sage with one hand and take a picture of it with the other, so just deal with it, ‘kay? 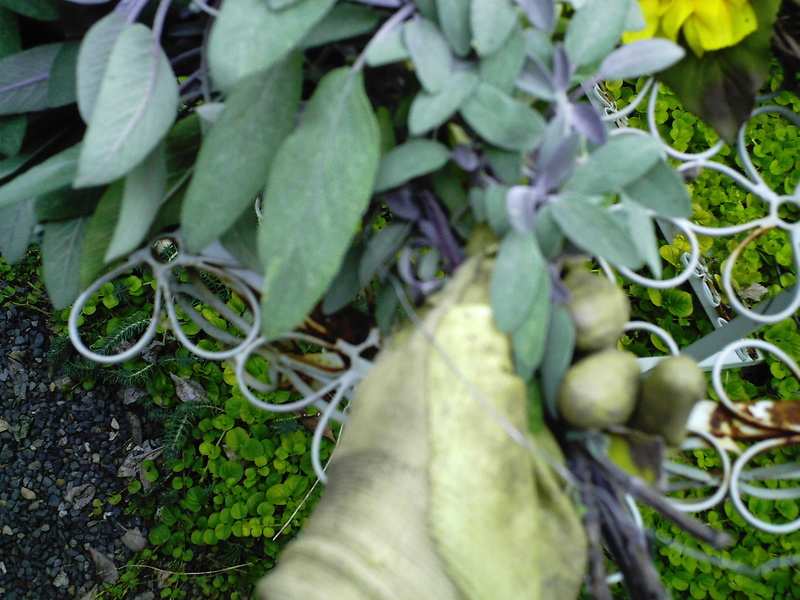 Here I am clumping sage, and notice there are some stems sticking out at the bottom. 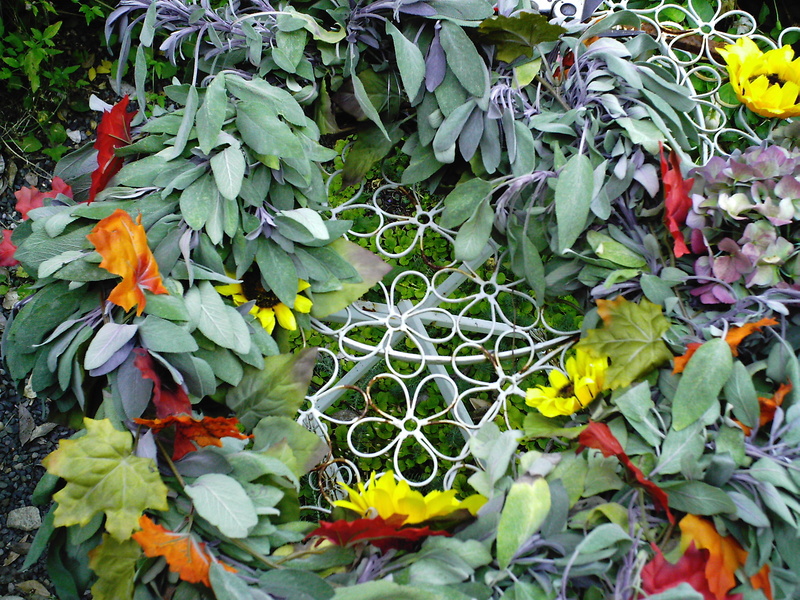 sage on the wreath completed--whew! 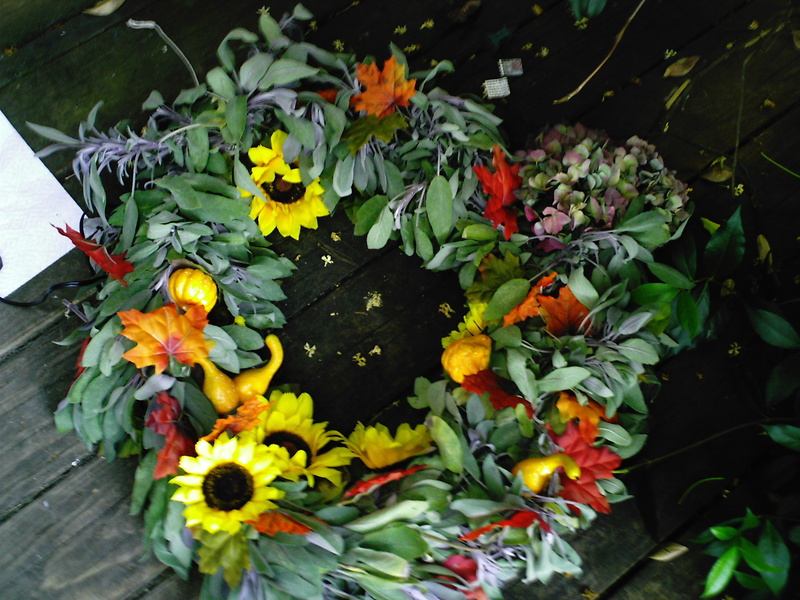 And here I’ve taken the garland and wired it in several spots (about 5-6) to the grapevine wreath form. 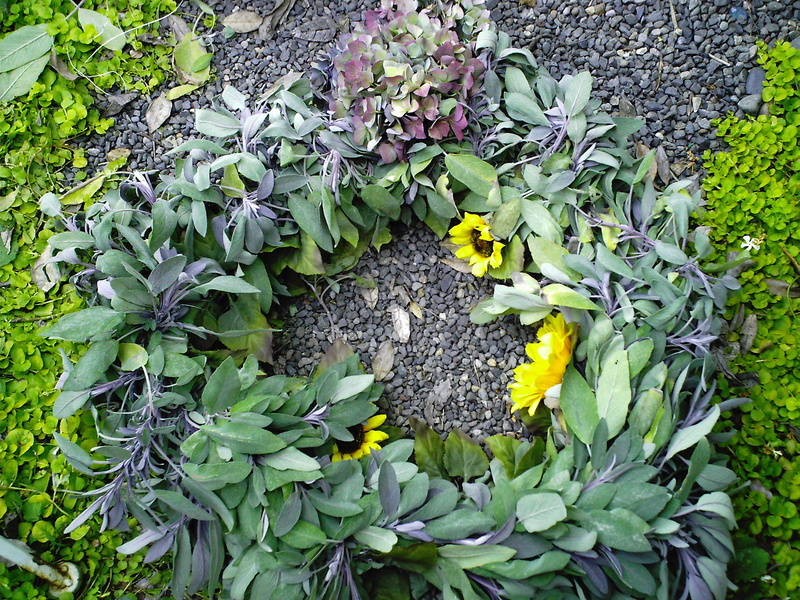 I made the garland pretty thick, because I didn’t want the wreath form to show, and also I know that the sage, as it dries, will shrink a little bit. I also decided to wire in a clump of hydrangeas in a spot that looked a little thin with sage leaves when I got the thing done. (Another wreath I saw used hydrangea flowers, although silk ones, in crafting a wreath to go from Thanksgiving to whenever you want to decorate for the winter holidays, so I swiped that idea as well for this wreath.) The real hydrangeas should dry nicely in place. I love how these bright fall colors play off the smoky purple. I just wraped this through the sage, so as to hide the fake plastic “vine” that holds the leaves together. I wired it to the wreath frame in a couple of spots. Adding the decorations is the easy, and to me at least, the fun part! 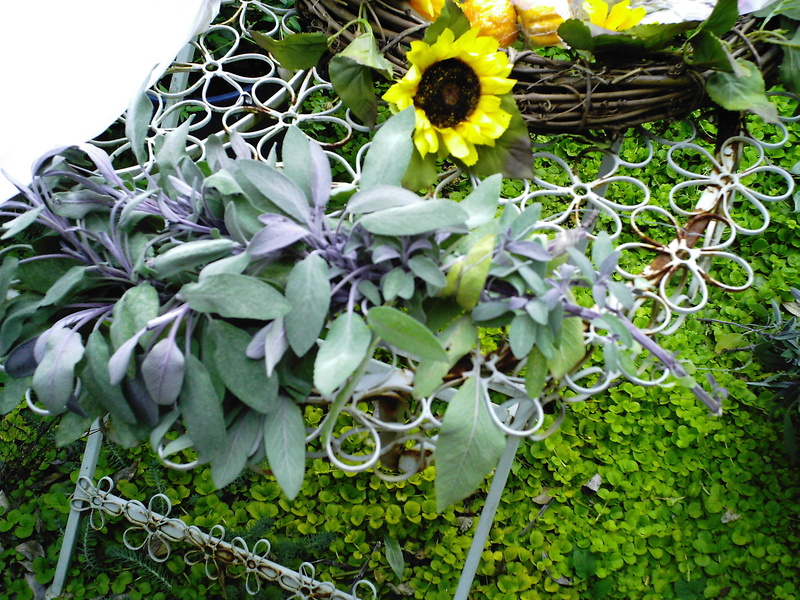 I knocked a few of the sunflowers off as I was wiring the sage to the wreath form, but no big deal. 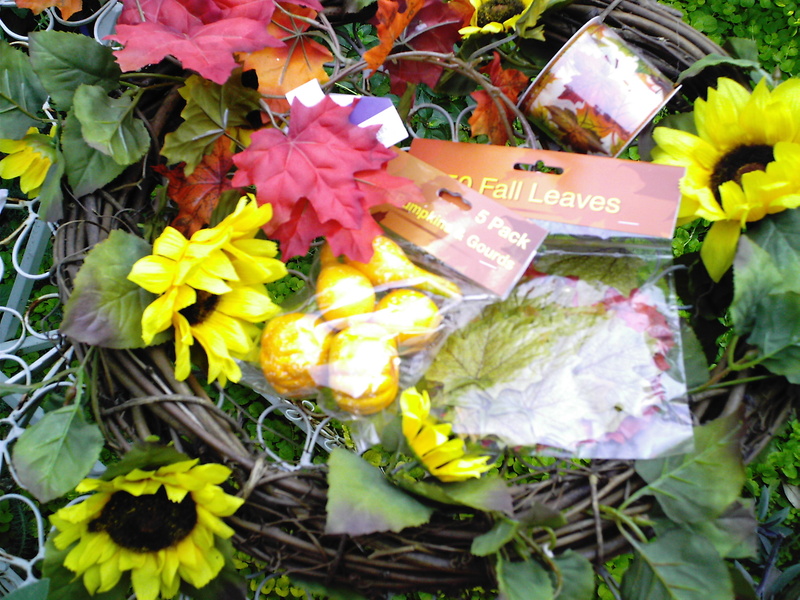 I used a glue gun, and for the plain-jane green leaves that were on the sunflower garland to begin with, I simply hot-glued on a decoration, be it a sunflower or an orange mini-pumpkin or gourd, and arranged them in an artistic fashion. 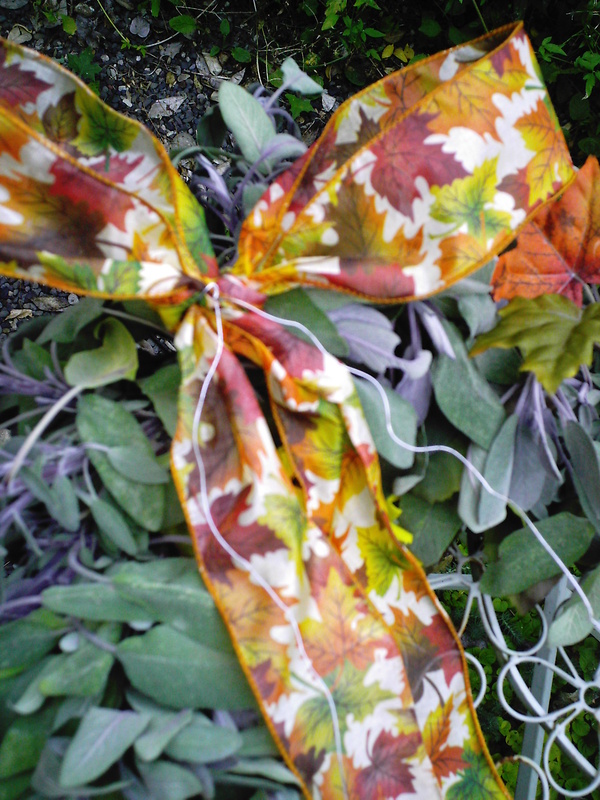 The fall ribbon bow I tied myself–Martha Stewart on her website has all kinds of how-tos for tying a variety of bows, and I did her simplest one, because again, these craft projects are not my strong suit. 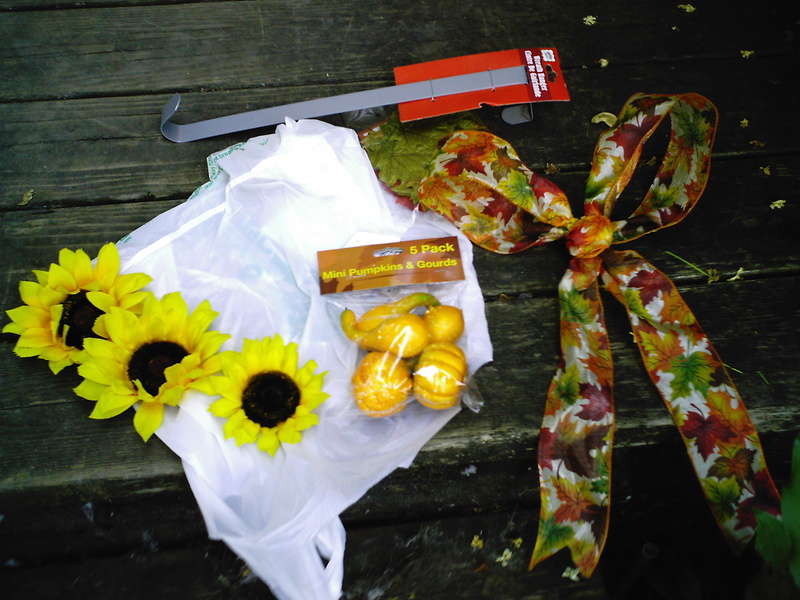 This picture also shows the nice metal wreath hanger I got at Dollar Tree as well. I love the grey color, and that it will blend in with the screen door. I ran some wire through the back of the bow, so it wouldn’t show, and just wired it into place at the top of the wreath. I like how the purplish tones play off the blue of the door frames. 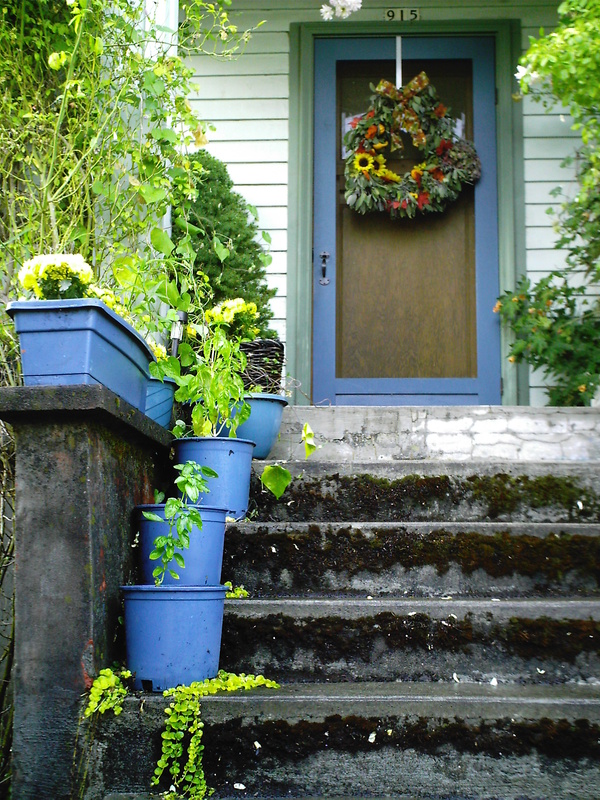 Since I was sprucing up the entryway, I found some bright yellow chrysanthemums for sale, so added those to window boxes and containers along the front steps leading to the front door. 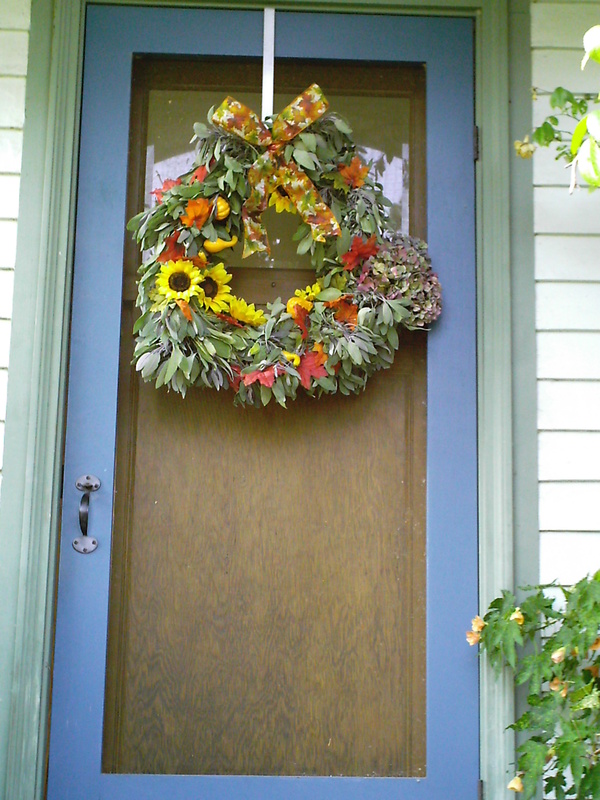 I hope I’ve inspired you to add a fall wreath to your front door. You don’t need to spend a lot of money to end up with something fun and festive to celebrate autumn! 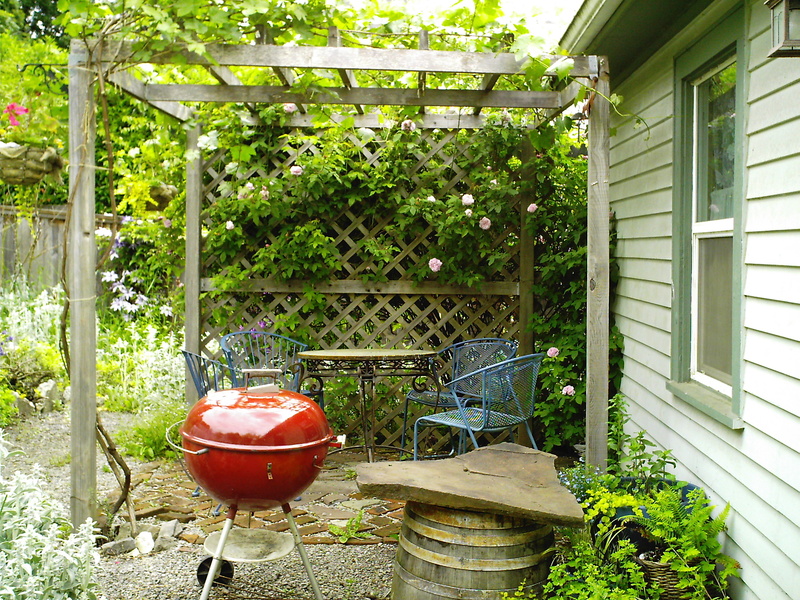 And visit the Garden Party.